tagged adam deitch, break science, colorado, hip hop, Jaw Gems, Lettuce, Re:Search Wednesdays, Shady Horns, show review, Um.. I went down to Cervantes this past Wednesday to see Um.., Ganz, Jaw Gems and Adam Deitch. 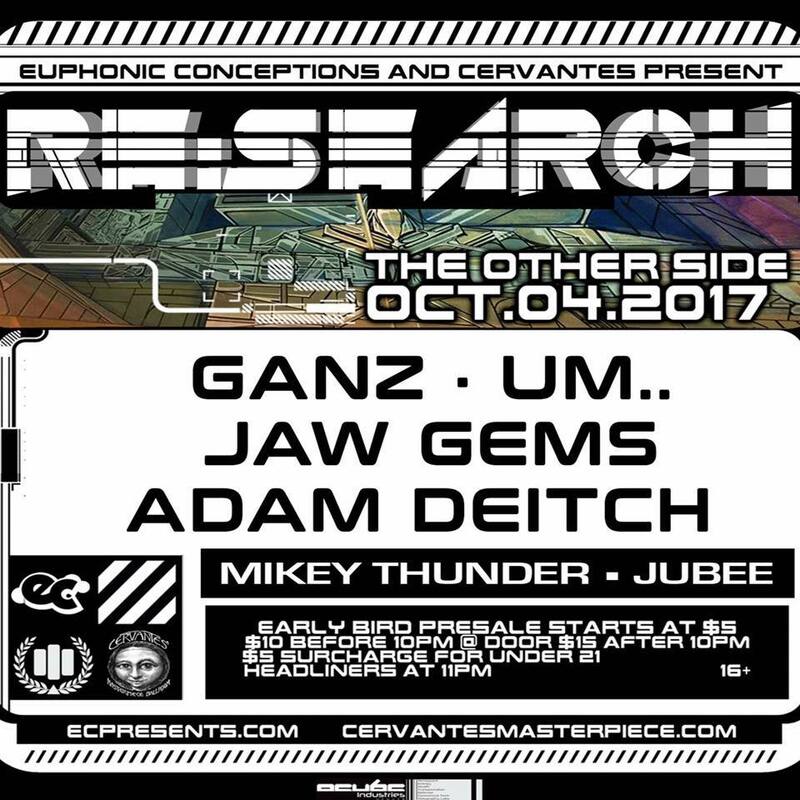 In the end it turned out to be a whole lot more than just these acts, and that’s to be expected from Re:Search Wednesdays at Cervantes. Often hosting special guests and regulars such as GRiZ and Borahm Lee, Re:Search Wednesdays are always sure to be a great time. When you first enter the venue through The Other Side entrance, a 450 capacity venue, Cervantes seems small and narrow. Upon walking in, it opens up in to an intimate spacious place with a great sound system for the size, chandeliers over the stage, visuals projected on the brick wall to the right of the stage, and a laser light show that never disappoints. Cervantes had both sides open tonight for a dual venue, generating a noticeable contrast between genres being played. With heavier bass music in the Ballroom and a more hip-hop/jazzy jam on The Other Side. Cervantes Masterpiece Ballroom hosted Um.. and Ganz this night. Um.. threw down the bass as they weaved through heavy dubstep, trap and other experimental bass genres. It was fun to see the tag team duo plot on stage about who’d play what next to send our brain and body into a twist. The venue holds 1000 at capacity and certainly felt pretty full from the start. With the bass creating a flow that made our bodies move like water, Um.. heated up the place reeaaal fast. Outside through the door to the back porch, opens up a beautiful space with wooden benches, a sculpted wooden overhang, and captivating murals on the walls. Re:Search Wednesdays often have vendors outside selling heady art pieces from gems, to posters, to pins and everything in between. As of July 26th, they’ve installed a silent disco on the back porch hosting two channels that alternate artists throughout the night. Sitting outside and smoking while listening to the silent disco can be fun for someone chilling alone, or for a group to have a dance circle to which happens often. The spotlight of the night however, was the stellar performances of Jaw Gems and the crazy superjam that ensued when Adam Deitch took the stage for his DJ set. Jaw Gems are an up and coming instrumental hip hop jazz band (self proclaimed as drip hop and ratchet jazz) that bring the funky flows. The band is spectacular but in particular, the melodies of keyboardist Hassan Muhammad sporting a Roland and M-audio really take you for a ride. He really captivates the brain and sends it on a journey with his complex flows jumping around the beat effortlessly with a great understanding of music and dance flow. They also opened for Thriftworks and Marvel Years at the Fox Theater on Friday in Boulder, and it was another amazing performance. Afterwards, the madness really ensued. Adam Deitch came on for a great DJ performance accompanied by his piano and drum skeleton kit as per the usual. He then proceeded to pull out special guests everywhere. First he brought out Nekoro Williams from People’s Blues of Richmond who played the following night at Cervantes for bluegrass Thursdays. He played along side Adam Deitch with the drum skeleton that Adam was working with. Next came Borahm Lee of Break Science for a little Adam Deitch curated Break Science segment. 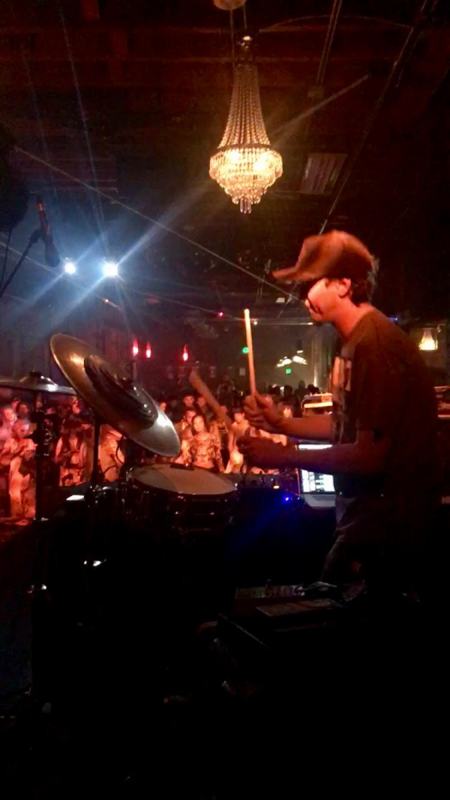 Adam Deitch then proceeded to bring out the entire Jaw Gems band, while Borahm and Hassan switched between playing both Hassan and Adam Deitch’s setup. Finally came the kicker, with Jesus Coomes as well as the Shady Horns of Lettuce, Eric Benny Bloom and Ryan Zoidis, coming out for an all out funk attack with everyone coming up on stage and switching around. Adam Deitch cut his computers music for much of this part and let the huge super-jam that he invited ensue. He played drums for most of it, and as one of the best drummers out there, it was definitely a treat. Jubee came out next, as always on Wednesdays, for his interesting mix of rapping and singing. Jubee’s lyrics and flow were good at times, but it was really his singing that captivated the crowd. His soulful voice along with Hassan’s melodies and Jesus’ bass brought an amazing funky experience that blew minds and had the whole venue packed and popping all the way into the hip hoppin’ finale. They really synced well as a group and impressed. I really cannot say enough about how awesome this experience was. Afterwards, Adam Deitch went back on to his computer after almost everyone left the stage, to finish it off for the still crowded venue. He played a few songs and spoke about his love for Denver and us fans in the crowd. He brought a great energy and seemed like he was having a lot fun on stage which definitely vibed with the crowd. These Re:Search Wednesdays are delivering musical greatness every week, and we’re more than thankful to be right in the middle of it all. Don’t miss out – do your RESEARCH!